Werther, the central character in Jules Massenet's four act opera of the same title based on The Sorrows of Young Werther by Goethe is an emotional yo-yo. He experiences soaring highs and wallowing lows. If he were alive today, medics would brand him as being bipolar. 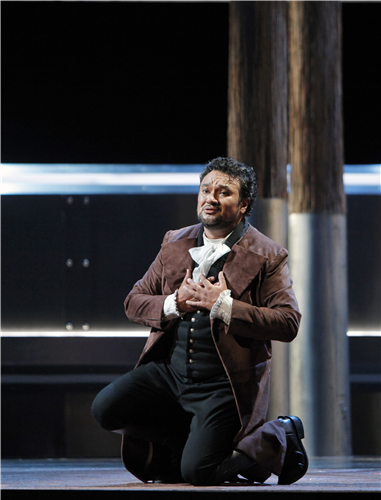 Francisco Negrin's new production, which opened last night at the San Francisco Opera, is similar in character. The singing and acting is all-round superlative. I was extremely taken with the drama and dexterity of mezzo-soprano Alice Coote's performance in particular in the role of Charlotte, Werther's paramour. The tenor Raon Vargas was also superb at the titular moper. He combined lightness and gravity in equal amounts. He seemed extremely human. But the mise en scene left much to be desired. The set, in particular, looked like it had been designed by IKEA, with its brushed steel walls and veneery-looking pale wood. When an oversized, overstocked bed was trundled on stage behind Coote, I almost lost it. And heavy-handed yet obscure symbolism abounded in the fussy use of angry red lighting and video. The design was screaming at us to read meaning into its various fussy details. But what exactly we were supposed to read at any moment, I wasn't completely sure. Still, the singing and acting carried Goethe's yearning tale for me. I left feeling moved.